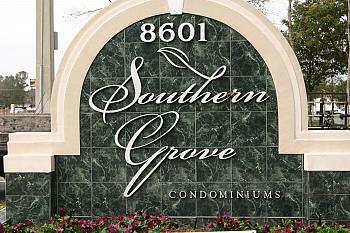 Southern Grove Condominiums in Jacksonville, Florida. Located on the Southside of Jacksonville is Southern Grove Condominiums. This newly construct community is situated on a rare, unspoiled tract of natural woods and meandering streams with ancient oaks and towering magnolias. Southern Grove offers luxury interior appointments rarely seen as standard features in this price range. Every residence has nine foot volume ceilings, walk-in closets in all bedrooms, a garden tub in the master bath, a separate laundry room, and a built-in computer area. With features like concrete block construction, home security system, window treatments, and ceiling fans included in the price of your homes, you may find that very little is needed in the way of extras. Ceramic tile is standard in the foyer and laundry room, and residents have a choice of three cabinet finishes. Choose from three flexible models with either two or three bedrooms: Charleston, Savannah, and Madison. Each exciting plan features a breakfast bar, built-in microwave, kitchen pantry, and roomy screened lanai. Association fees include water, sewer and cable. Home prices from $150's to $170's. Live the good life with an ease you never imagined. Relax with a refreshing dip in the community pool, work out in the exercise room, or stroll along the edge of a natural forest. Admire the beautifully landscaped grounds, smug in the knowledge that you, the smart buyer, didn't have to lift a finger to make it so. The builder commitment to high quality and outstanding value is evident in the careful planning and attention to detail found throughout the Southern Grove community. Care was taken to maximize views from each peaceful screened lanai, and the community has been created with both aesthetics and efficiency in mind. Reserved parking is set aside for the convenience of residents, and an auto detailing area is available on site. For the buyer who requires something extra, a generous selection of upgrades is available for a custom look or to complement your furnishings. Private garages are available for optional purchase.